Clean, renewable solar energy makes sense, doesn’t it? Despite the duration solar has been around and acknowledged as the way to go, why is it that only one million households in the United States have solar installations? Recognizing and overcoming the barriers to owning and installing solar collection is the passion of the Clean Energy Collective (CEC), a local Carbondale company, and CEC’s overwhelming and exciting success proves it has a great idea, the correct technology, and the right timing. It is safe to say that it requires a high degree of motivation for the one million homeowners who have installed individual solar systems. It would be easy to become discouraged: the budget for the upfront cost of home solar collectors is in the range of $25,000–$30,000, and the roof area needs to be unobstructed and without shade. Combined, this prevents approximately 80 percent from going further, and for the percentage that do, zoning would have to allow for solar collectors, and the home would need to be outside the jurisdiction of a homeowners association (HOA) or to receive the HOA’s permission. Because of many HOA’s concerns for home values and the neighborhood’s character and appeal, HOAs have in frequent cases withheld this permission. However, if all this has been successfully addressed, the property owner then has to research the kind of system wanted and to retain an installer. On the paperwork side, home solar systems require building permits, a site survey, and engineered plans. Rewiring is necessary to accommodate on-site power generation, and connecting with the utility requires a net-metering junction box, and all this is in addition to installing the panels. After the system is successfully in place, maintenance and repairs are the ongoing responsibilities of the homeowner. Then, if the owners move, the investment of the installation and the financial return go with the sale. As the frog says, it isn’t easy to be green. The ease, accessibility, and financial advantage of community solar gardens combine to make it the fastest growing segment of solar growth in Colorado. “This concept represents the future of clean energy by opening the market of solar ownership to everyone with a utility bill. It’s not supplanting people who can and want to put solar on their house, but rather expands the market to the other 98 percent of electricity users,” explains Spencer. Paul Spencer came up with the innovative concept as the cofounder and president of Bonsai Communities where he spearheaded sustainably developed neighborhoods, including the state’s first net-zero community, TCI Lane Ranch in Carbondale. It was for that 89-unit development that Spencer concluded the benefits of centrally aggregating the solar collectors, and then worked with the local utility to make it a reality. This concept became the Clean Energy Collective—CEC. All the power from the community solar garden flows directly into the power grid. One of the obstacles to aggregating the individually owned solar collectors was keeping track of the power generated and crediting the value of the power back to the owner. Spencer addressed this with the CEC RemoteMeter™, a custom software package that tracks the fractional energy production of each individual collective member and stores the real-time meter-reading data for processing and reporting to the utilities. The RemoteMeter integrates with the utility billing system to track and credit the clean energy production directly to the customer’s bill. It also lets customers monitor real-time energy production and account information online. “This billing structure doesn’t burden the utility and is simple for everyone involved,” notes Spencer, adding that the system avoids complicated operational and administrative burdens, navigates security regulations, and allows members to qualify for tax and rebate incentives. The collective concept ushers in a new era of power generation where an organization builds, operates, and maintains the clean-energy facility. At the same time, the participating customers collectively own the facility and reap the benefits. They additionally do not have the burden of an individual system. 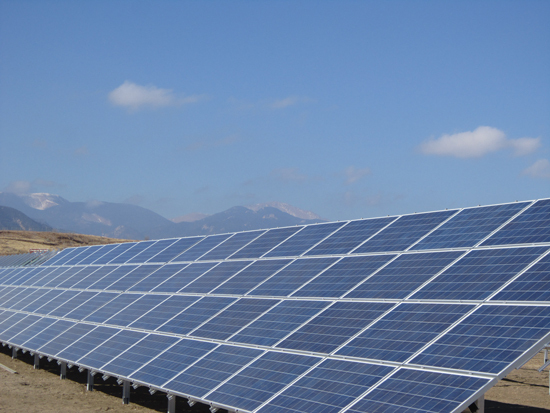 Under the CEC model, the community solar facility is constructed on a site ideally suited for maximum exposure to the sun. It is professionally maintained 365 days a year for the 50-year lifetime in a manner to ensure the greatest power production possible, which in turn offers the greatest customer return. The next step was a pilot in El Jebel, located between Carbondale and Basalt, and it further launched CEC in 2010. Paul Spencer worked with the Mid Valley Metropolitan District (MVMD) in El Jebel to gain their support, and he identified a less than half-acre site. The project sold out in a few weeks, and soon 19 CEC members benefited from 338 modules that produce 86 kW. Interestingly, the community solar gardens are a good use for parcels that may be limited in options for future development like brownfields (land where the future use is clouded by past industrial or commercial use and the potential for contamination) or closed landfills. In three-year’s time, CEC has 23 facilities online or in development representing 10 MW of community-scale energy. In the next 18 months, CEC anticipates this number to triple. 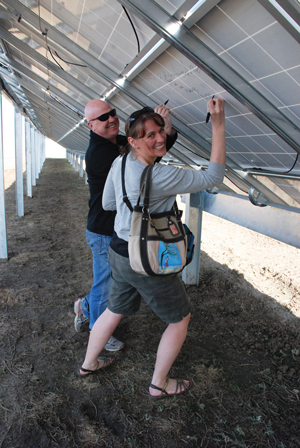 CEC has seven community solar facilities operating in Colorado alone with others in New Mexico, Minnesota, and Vermont. Combined, these facilities represent 3.7 MW of distributed power. It is the largest participant the Solar*Rewards Communities program with 11 community-owned solar gardens that will be accessible to 95% of Colorado ratepayers. It’s rare that something that feels good and rates environmentally responsible also pencils out to be a sound investment, but this is the case with Clean Energy Collective. Buy-in is within reach for most prospective customers with a cost as low as $535 for a single 230 W panel. After rebates and incentives, this is a net cost of less than $2.50/watt. Paul Spencer explains, “Our members leverage their collective purchasing power and buy as little or as much energy equipment as they choose.” And because it’s professionally managed, it generates more power for much longer. This means that as energy prices continue to rise, the investment improves over the long run. The CEC systems are independent assets that are not attached to a home’s property. The asset can be sold, gifted to a family member or charity, or transferred to a new residence within the utility territory. Earnings credited to the utility bill pay off the capital cost in well under ten years, and the equipment has an expected 50-year life when it returns earnings. In the case where a business buys a panel, it becomes a depreciable asset instead of an operating expense. Lenders see the attractiveness and are backing the project. Denver-based Sooper Credit Union jumped in early as a partner to CEC and lender. Community Energy Collective is not just a local company that is looking positively to the future, but one that has positively changed the future. Signup can be as easy as a telephone call. Check them out on the web to find the nearest project. The future of solar is here.